Traumatic brain injury is a direct (impact to the head) or indirect (shaking as in whiplash or “shaken baby”) mechanical injury to the brain that results in tearing, stretching, or shearing of tissue, secondary inflammation, and neurological dysfunction. Current estimates are 4.8 million cases yearly in the United States, 75% of which are mild TBI (concussion). Over 50,000 people die in the U.S. every year from severe TBI. Traumatic brain injury is characterized by altered consciousness or loss of consciousness with varying severities of injury (mild, moderate, or severe) that are proportional to the force of injury and cause anywhere from temporary neurologic dysfunction to death. Up to 55% of all mild TBI patients develop the persistent post-concussion syndrome characterized by cognitive symptoms, headache, irritability, sleep disruption, fatigue, dizziness, depression, anxiety, apathy, and change in personality. HBOT is the only therapy that directly treats the underlying disease processes of TBI (decreased oxygen, decreased blood flow, swelling of the brain, constriction of blood vessels, acidosis, anaerobic metabolism). HBOT has been shown in multiple studies to have the greatest reduction in mortality of any therapy. One to three sessions of HBOT in the acute period can decrease the mortality by 50-60% (see Rockswold review below). There is very little published experience of HBOT in mild TBI, but in Dr. Harch’s career he has treated many patients within the first week after concussion/mild TBI. With just a few treatments at our clinic, most patients experience near complete or complete relief of symptoms. For patients with the persistent post-concussion syndrome, HBOT is the most effective therapy known. Dr. Harch has shown that HBOT is effective in relieving symptoms in both civilian and military blast-injured patients, and that HBOT causes a reduction in suicidal ideation in veterans. 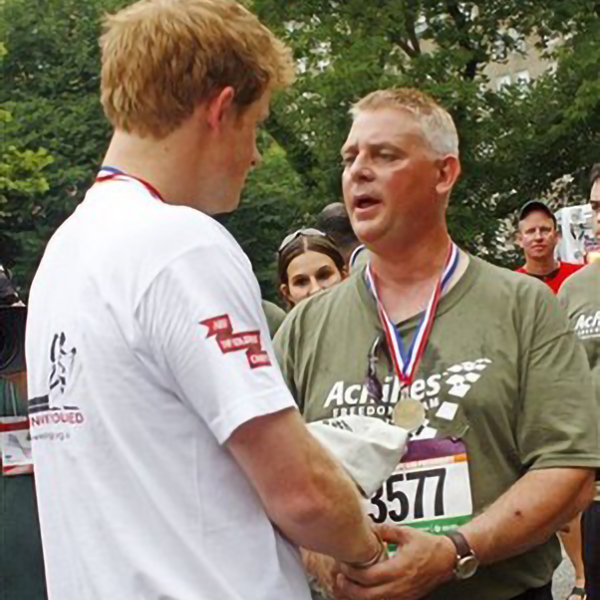 See Curt Allen’s story here. See Rusty Ouart’s story here. Geoffrey was a 19 year old young man who was involved in a severe motor vehicle accident on an icy winter night in 1989. He was comatose at the scene, spent weeks in the ICU on a ventilator, and then months in a rehabilitation hospital. He was discharged to home and the care of his mother with inappropriate social behavior, cognitive deficits, and repeating sentences in conversation, and he required round-the-clock supervision. His repetitiveness was a particular stressor for his parents, and they were seeking institutional placement for Geoffrey. He was referred for evaluation for HBOT nearly 3 years after his accident. Geoffrey’s SPECT scans before and after one HBOT: The before-HBOT scan is on the left and the after-1 HBOT scan is on the right. The first picture is the slices of the top half of the brain and the second picture is the lower half of the brain. Note the irregular appearance of the brain before HBOT and the global increase in blood flow after the first HBOT. 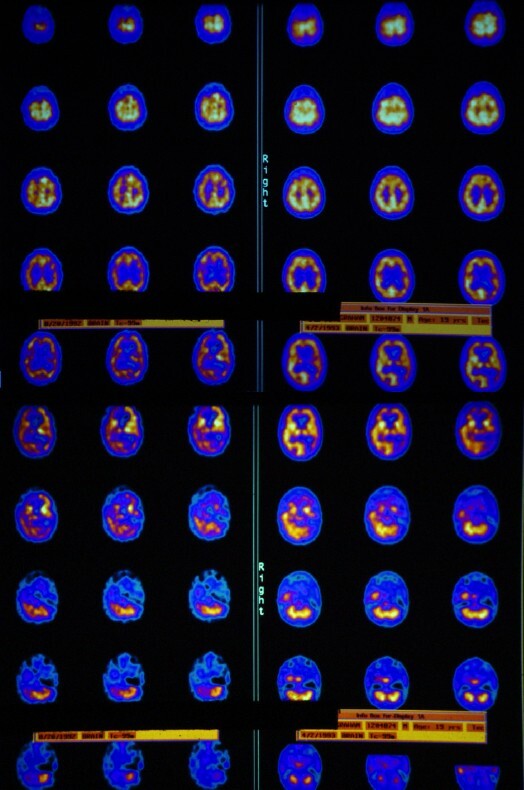 In particular, notice the decreased blood flow in the right frontal lobe in the second picture below (white arrow on the second slice in the first row of the pre-HBOT scan on the left) and the normalization/correction of blood flow in the right frontal lobe (white arrow) on the after-1 HBOT scan on the right (first row second slice). Note: A SPECT scan is often performed before HBOT and again after one HBOT to display recoverable brain tissue. In order for the increased blood flow to be more permanent, at least approximately 40 treatments are then completed. 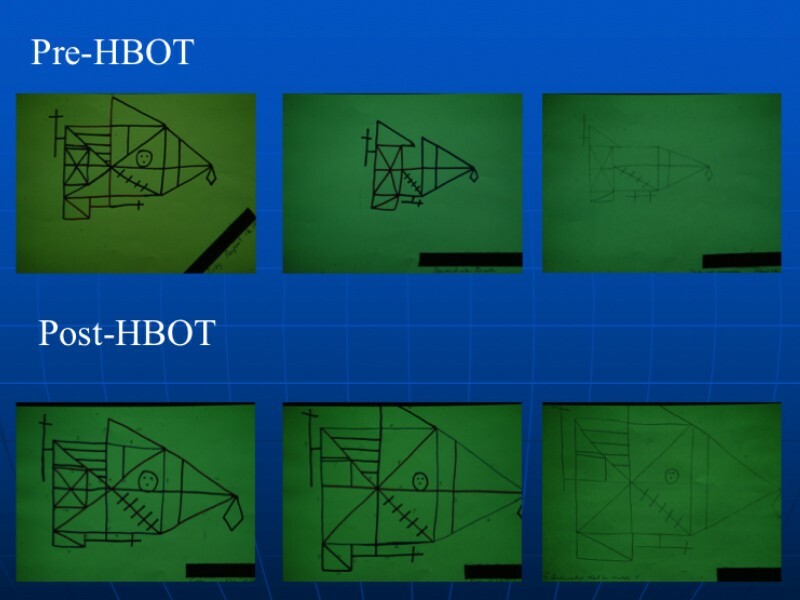 Geoffrey’s SPECT scans before HBOT and after 67 HBOTs: the before-HBOT scan is on the left and the after-67 HBOTs scan on the right. The first picture is the top half of the brain and the second picture the lower half. Again, note the global improvement in blood flow and the less irregular appearance of the brain after 67 HBOTs, now a more permanent effect consistent with Geoffrey’s global improvement. 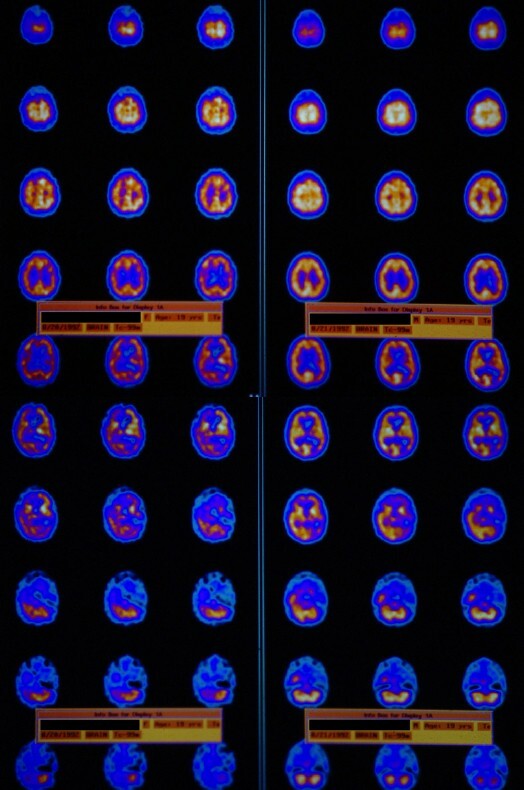 Again, notice the decreased blood flow in the right frontal lobe of the second picture below (white arrow on the second slice in the first row of the pre-HBOT scan on the left) and the normalization of blood flow in the right frontal lobe (white arrow) on the after-1 HBOT scan on the right (first row second slice). This reflects the improved function in the right frontal lobe that is seen on the Rey-Osterrieth Complex Figure drawings below these scans. After the 67 HBOTs Geoffrey was re-tested cognitively. One of the most rigorous tests of memory and frontal lobe function (Geoffrey had prominent injury to his frontal lobes) is the Rey-Osterrieth Complex Figure drawing. This was administered to Geoffrey before and after HBOT. Geoffrey was first given the Rey figure to copy. The picture is then removed and he is asked to draw it again from memory. He is asked to draw it again 30 minutes later. The picture below shows Geoffrey’s Rey figures before HBOT on the top row and after 67 HBOTs on the bottom row. Notice that Geoffrey’s figure after HBOT maintains detail (memory) and size. The improvement in blood flow seen on the scans above is responsible for Geoffrey’s clinical improvement and improvement in memory and frontal lobe function seen on the Rey Figure. https://www-ncbi-nlm-nih-gov.ezproxy.lsuhsc.edu/pubmed/29152209 (Dr. Harch’s study in veterans with blast TBI and PTSD. The discussion section includes a review of all of the HBOT studies in mild TBI persistent post-concussion syndrome).